When I got my painting degree back a few years (ok, decades) ago, I pretty much only painted outdoors. I loved the colors and the lighting. One semester, I was allowed to travel throughout Europe, painting as I went along. Wow – the colors were so deep and rich! Well, with time, I got married, began to raise a family, and was told that I needed to get a “real job.” I began working as a graphic designer and specialized in developing new typefaces. But I never gave up painting. Nope, not ever. I held on to my Jullian French easel and kept a fresh supply of paints and brushes. Sure enough, there came the day when I was able to get out of my office and go out and paint! Yeah! I was beside myself with enthusiasm. I set up my easel on the hillside and began to paint the valley below our home. That is, until the light changed. I touched up my painting and tried to match the new light, but to no avail. As fast as I could change my painting, the light would change again. In all fairness, I should say here that I am not a speedy painter. I put so much thought into my work that the seasons could pass and I would still not be finished. I could see that if I wanted to continue painting, I would need to set up an indoor studio with stable lighting. But from what I could remember from art school, the harsh lighting was just terrible to paint by. It did not look natural, it was too bright and I got headaches from squinting so much. Since I ruled out painting in the wild, I went shopping for lighting that would help me achieve the most natural coloring indoors. The lamp I decided on was a Daylight Table Top lamp, and I’ll tell you why. First of all, it’s a full spectrum light that I could easily put on the table near my table easel. I was very happy with my decision for several reasons. First of all was the natural light it produces. There is no glare and the lighting is stable, meaning I can take a break, come back to it and it will still be the same. I can work for hours without squinting, so no headache involved here. I can pivot the head into different angles for different effects, and it’s low in energy consumption. Its 18-watt bulb puts out what would equal a 100-watt tungsten filament bulb, so the 75% energy savings is a real plus. It doesn’t heat up, so I can keep my studio at a comfortable temperature. I was so happy with the Daylight Table Top Lamp, that I took it to my design studio. I love the light it provides and the fact that I can work for hours without my eyes wearing out. To replace it in my painting studio, I bought the Daylight Professional Artists Lamp. It’s cool looking and I can move it from my standing easel to my tabletop easel quickly. 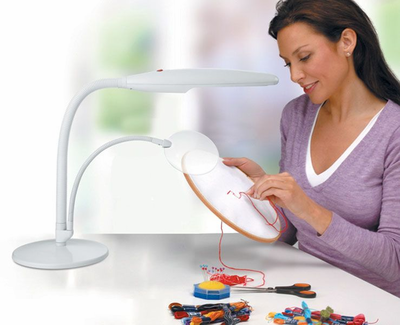 It has clamps to attach it to either easel and its flexible arm makes it easy to affix in any position or angle. When I’m finished with each painting, I use the same light to photograph my work. What can I say? Times have changed – for the better! Instead of suffering with the changing skyline or harsh shadows, I can now take control of the lighting and get the results I want.